Like it or not, there is no chance whatsoever that Apple will ever make a laptop that runs iOS. It’s true that iOS apps will run on Mac computers… someday… but that’s not the same at all. If you really want an iOS experience with a laptop form factor, definitely check out the Logitech iPad Pro 10.5 inch Slim Combo Keyboard Case. 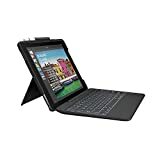 This great case consists of two parts, a full-size backlit keyboard that’s wonderfully comfortable to use, and a rear shell with a kickstand to prob up your tablet. It’s awesome and it’s on sale at a discount right now on Amazon.